I passed!! YAY for me!!!!!!!!! I feel SO much better now - y'all have NO idea how stressed I was about passing this nail course - the written part was really bothering me as there was a lot to it - I had to know all kinds of things (anatomy of the hands/arm, parts of cells and what they're made of, finctions of the skin, nail disorders and diseases - what they're called, how they're caused and how to treat them, besides everything to do with the nail and of course all the gel components) and everyone seems so shocked that I actually had to WRITE an exam to pass the course. I had to do a practical exam as well - passed that too (during it I really thought I was going to fail - nothing felt like it was working properly and I was getting SO frustrated). Ahh well - I passed (with high marks too!) and it feels SO good! 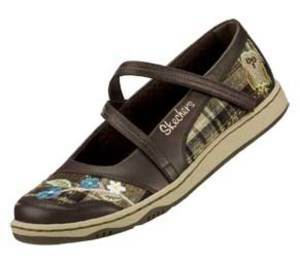 They are WAY cuter in real life - see the owl by the heel? It has brads for eyes ROFLOL!!! I haven't forgotten about the Sunday Q&A post - I will either get to it this week or else save it all for next Sunday. I was up at 5 am this morning and am completely DRAINED. I need to let this day sink in and relax a bit before tackling the week! I sat down for a bit last night and ended up cranking out 5 cards (I know I was shocked too ----- LOL *wink*) so here they all are! 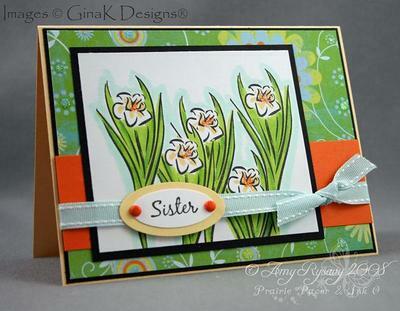 All stamps used are from GinaK Designs. First off here's my sample for my Friday Sketch #11 <-------click! I stamped the tulip from GinaK's Spring Blooms set (you can't buy it - you get it for free if you buy any 3 stamp sets) then colored it in with Copic Markers. I used Star Dust stickles on the flower, you can't tell but the DCWV patterned paper has bits of glitter on it too - really cool stuff. The "friend" stamp is from Gina's Tag, You're It! set. This card uses the same DCWV patterned paper as the card above - and I hafta say I am really pleased with how it turned out! 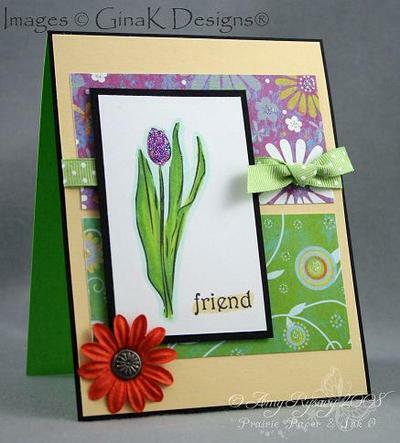 I used the same GinaK Spring Blooms set - stamping and masking a couple of the blooms then stamping more of the flowers - making them appear "behind" the ones I had masked. I used Copic markers to color in the flowers then added a bit of Star Dust stickles to the flowers themselves. 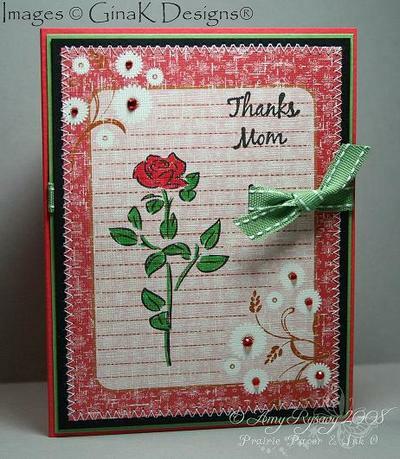 The sentiment is from the same set - I punched it out with Stampin' Up! 's small oval punch, matted it with a SU! large oval punch, then attached it to the (SU!) ribbon with DoodleBug brads. The stamps used on the next 3 cards are by Rupa Shevde - a new illustrator for GinaK designs. You can see the full set here. I stamped the topiary then colored it in with Copic markers - you can see that I added Stickles to the centers. 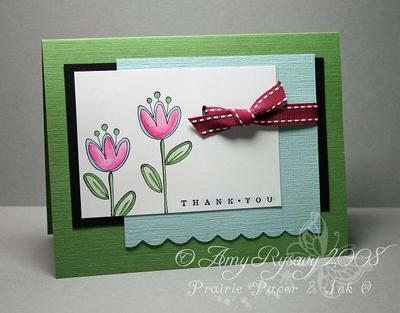 I stamped the sentiment on the side then added the DoodleBug brads. The blue ribbon is May Arts, the orange is Stampin' Up! - and same patterned paper as above. For the last 2 cards I used more of my Daisy Bucket patterned paper. I used Copic Markers to color in the image, stamped the sentiment then trimmed it with my paper trimmer and used my Stampin' Up! Word Window Punch to round the edges. 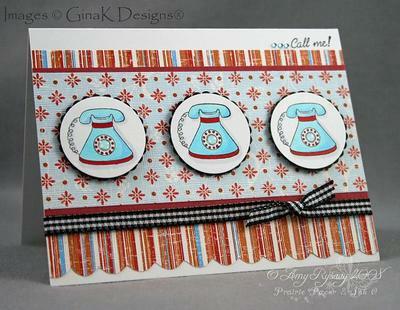 I stamped the phone 3 times, punched them out with Stampin' Up! 's 1 3/8" circle punch, then colored them in with Copic Markers. I matted each circle with a Marvy Extra Jumbo Scalloped circle punched out of black card stock. I used some little clear rain dots from GinaK's store in the center of the dial on each phone - they fit perfectly!! I finished off the card with some black gingham ribbon, and the sentiment (the bling in front of the sentiment is from A Muse). FYI if you haven't already seen it you can check out my little video tutorial HERE on how I use my corner rounder punch to make a scalloped edge. Here you go everyone!! I didn't have the time to make something from scratch (insert sad face) so I used the layout from the card I posted the other day <--------click! I did 3 more sets of nails yesterday and have one if not 2 sets to do today plus studying - it's getting down to crunch time now! I'm HOPING I can squeeze in a little stamping time either later today or tomorrow - and I will get another sample made up to go with this sketch (it's pretty basic so I think it will be easy to use!!). If you upload your card using this sketch to any public galleries please use the keyword AMYRS19 to make it easier to find. 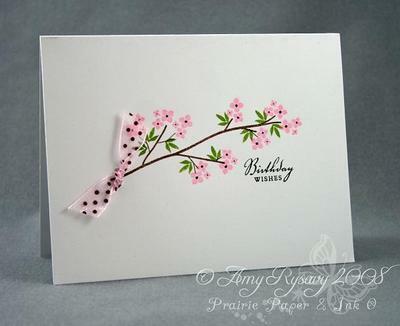 I made this card the other night with GinaK's new Spring Blooms stamp set (you can't buy this set - you get it for free when you order any 3 stamp sets). The patterned paper is by Daisy Bucket called Bellflower - there's 4 different 6x6 patterns on one sheet of 12x12 paper - I thought that was pretty cool so I cut and trimmed down the one pattern. I didn't really want to cover the paper as it's so pretty (and slightly textured too) so I stamped right on it with VersaMagic Onyx black ink. You can't see it in the picture but I went over the rose with my Clear Spica Glitter Pen so there's a subtle sparkle all over it - SO pretty in real life! 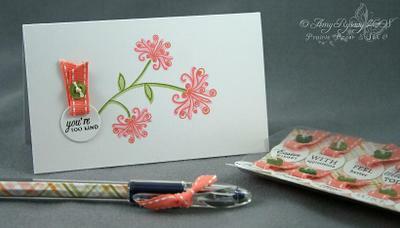 I finished off the card with some Wild Wasabi ribbon (Stampin' Up! 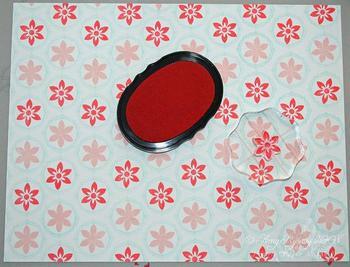 ), and some bling in the flower centers (A Muse), and stitching the patterned paper to the black card stock. I hope y'all like it! I hafta run and do yet another set of nails this afternoon ! I had a VERY long day yesterday -------- I spent about 9 hours doing nails (my back is killing me!) and I actually have another lady coming over right away to get her nails done. However I shall have a card or two to share later on today. I just wanted to come on here and post and first off say thank you (again!) for all the well-wishes and good luck on my nail course - I still have a lot of nails I need to do before the weekend and a TON of studying to do and I can't wait for this week to be OVER! What I thought would be nice is if you guys have any stamping-related questions or questions about any particular cards I've posted recently you can post them in the comment section of this post and I will use them for my Sunday Q&A post (makes it SO much easier to have all the questions in one spot and less likely that I will miss one!). Just a really fast post today - I am heading out the door to run errands and then I have to get caught up around the house and whatnot as I have 3 people coming over to get their nails done (yay for that but that means it's going to be a LONG day!). This card uses all Stampin' Up! supplies - the Time Well Spent level 3 hostess set, the Take Three stamp set for the sentiment, and the 2 black flowers are rub-ons from the Eastern Elegance rub-ons set. I used a blender pen and ink to color in the flower. I ended up making several of the same - the patterned paper is by Chatterbox and I cut a full 12x12" sheet into 9 4x4" squares - so I ended up making 9 cards. 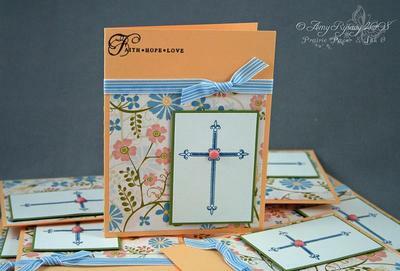 The stamps used are from Papertrey's Everyday Blessings stamp set - I stamped the cross in Bordering Blue (Stampin' Up!) ink then added a pink brad to the center. The ribbon is May Arts, and the card base is SU! Apricot Appeal card stock. I stamped the sentiment from the set in black ink and it was done! By keeping them simple and all the same - using the one sheet of CS and all the same colors/layout/embellishment/etc I was able to make all 9 cards in no time! Here is another card I made last month and never posted. I STILL haven't stamped anything recently (it's been over 2 weeks!) and don't know when I will get the chance. My nail course exam is next weekend and I have a LOT of studying to do, not to mention I need to get 9 sets of nails done in a week and a half in order to pass and I already had one person not show up. So needless to say I'm feeling pretty bummed out right now and definitely not in the mood to stamp. In a way that's prolly a good thing as I have about 15 loads of laundry to do to get caught up with after being so sick! Anywho this card uses Papertrey's Out on a Limb stamp set. I stamped the limb using Stampin' Up! 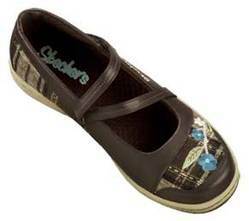 Chocolate Chip ink, then the flowers in Pretty in Pink and the leaves in Olive. I dotted the flowers with a black marker, stamped the sentiment in black, then punched the holes and added some May Arts ribbon and that was it! A super-quick (less than 10 minutes) card. I went through my computer files to find something to post today as I haven't stamped in like 2 weeks (those Papertrey projects I shared last week I had already done ahead of time as I was too sick to make anything!). 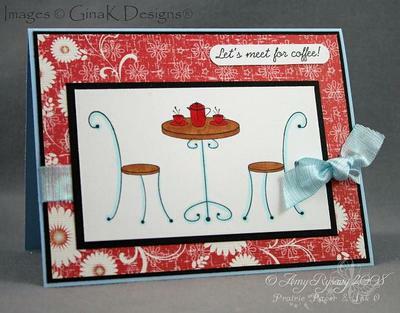 Anywho this card was made using all Stampin' Up! supplies - the level 3 Time Well Spent stamp set and the sentiment from the Take Three set. I used ink and a blender pen to color in the flowers, and textured In Color card stock to make it all pop! I have to go attempt to get the laundry done - we need clean clothes! 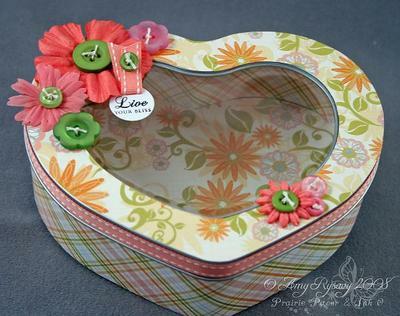 When I first got my hands on one of Papertrey's Large Heart Tins I wondered what I wanted to do with it. I wanted to not only decorate it but also incorporate something into it that would be useful to the person I plan on giving it to. What I had decided to do with my tin was to make a card kit for someone special. But not just any card kit - one where they would be able to choose exactly WHICH type of card they needed to send out. The first thing I did was decorate the tin itself. I used Chatterbox patterned paper - both patterns are from their Villa line. I followed Debbie's easy instructions for adhering the paper to the lid, then added a few Prima flowers and some buttons from my (large) collection (see the 2 flower shaped buttons? Aren't they the cutest things ever? I've been hoarding them for MONTHS to be used on a special project and this definitely fit the bill) using mini glue dots to adhere them to the lid. To adhere the paper to the tin I used Mono Multi glue - it has a little "give" before it sets - making it easier to cover the tin. 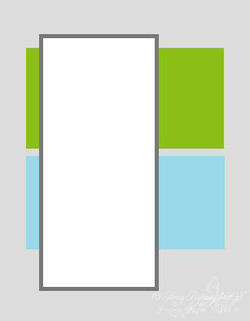 I will get to the little tag lower down in this post. 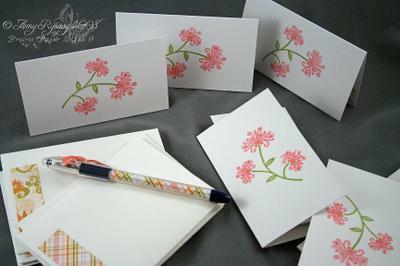 I created 8 3x5" cards (that is the biggest that will fit in the tin) and stamped them with the floral images from Papertrey's Spiral Bouquet stamp set using Stampin' Up! inks (Certainly Celery, Old Olive, Pretty in Pink and Groovy Guava). Inside each card I adhered a small strip of the same patterned papers I used to cover the tin - it just gave them a more finished look. I also created my own envelopes for the cards. 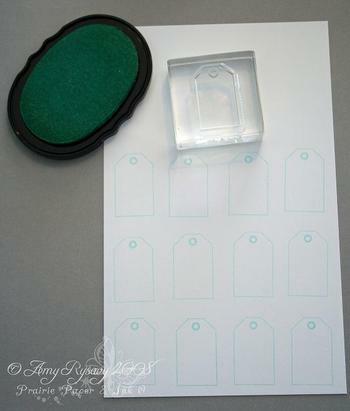 I have a template that I got from Stampin' Up! some time ago before they retired them - but you can also follow the tutorial Lauren did here with the Scor-pal - you can make envelopes in any size you need with her tutorial! I used Stampin' Up! 's white wrapping paper to make my envelopes as it's a nice light weight for them. On each envelope I adhered a strip of patterned paper to keep them from being too plain, and I also took a small strip of the paper and rolled it tightly and inserted it into a RSVP pen and tied a small piece of ribbon to the pen lid to match. Now for the part where the recipient has a say in all of this. I didn't want to stamp sentiments on any of the cards b/c how am I to know exactly what type of cards they will need? But at the same time I couldn't just leave them blank b/c most people feel that a card is missing something if there is no sentiment - so I came up with this. 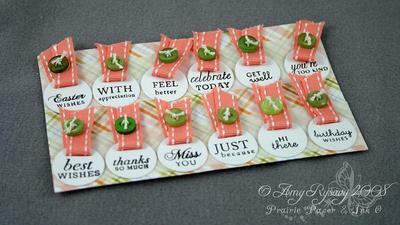 I used my CuttleBug and the Tiny Tags die cut and cut out a dozen of these small circular tags. I then stamped each tag with a different sentiment from the Mixed Messages stamp set (they are the PERFECT size for these tags! And the fonts on them are fabulous). To finish off the tags I added a bit of ribbon (all the ribbon used for this project is Stampin' Up! 's Groovy Guava stitched grosgrain - it was a really good match to the Chatterbox paper - altho Papertrey's soon-to-be-released Sweet Blush ribbon and inks would work perfectly as well) and sewed on a mini green button with string to hold the ribbon in place. To make the tags usable for the receiver - I took a piece of patterned paper and attached 2 strips of the paper that mini glue dots come on (it's kind of similar to wax paper). I just used double sided tape to adhere the strips to the paper. I then placed a mini glue dot on the back of each tag and placed them onto the strips as you can see in the picture above. So now all the receiver has to do is peel of the sentiment of their choice and adhere it to the card! I made a simple little envelope out of a transparency sheet to hold the sheet of tags in so that they don't get damaged and on the backside of that paper I am including a sheet of postage stamps so that everything will be taken care of. This is how it all looks when packaged together. The envelopes were a little too big to fit in the tin since they measured about 3.5x5.25" - so I put them into a clear A2 (4.25x5.5") envelope and placed them under the tin - I then took a longer length of ribbon and tied it around the middle of the tin to hold the pack of envelopes in place. The best thing about this gift is even when they use up all the cards they can keep using the tin to store whatever trinkets they want in it! STAMPS: Papertrey's Spiral Bouquet and Mixed Messages Stamp Sets. 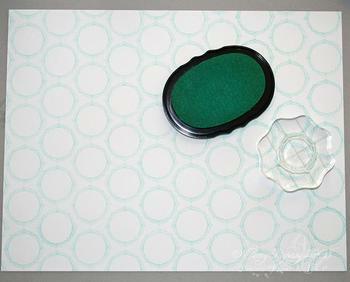 CS: Papertrey Stamper's Select White Card Stock, Chatterbox Villa Patterned Paper. INK: Versafine Onyx Black, Stampin' Up! Classic Certainly Celery, Old Olive, Pretty in Pink and Groovy Guava. 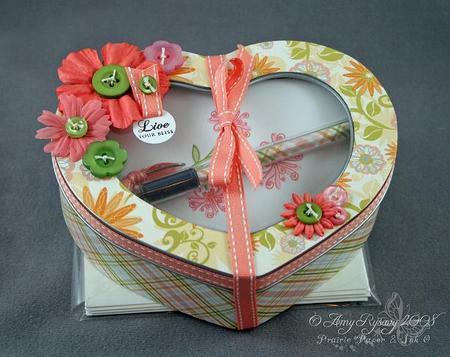 ACCESSORIES: Papertrey Large Heart Tin, CuttleBug Tiny Tags Die, Prima Flowers, Buttons, Ribbon, String, RSVP Pen, Clear Envelope (Stampin' Up!). I hope you all enjoyed this project and if you decide to recreate one for yourself (or to give as a gift!) I would love to see it so make sure to link to it in the comment section here if you post it online! Well I finally couldn't take it anymore and went to the hospital last night - turns out I have bronchitis! So I now have me some meds and am REALLY praying they do the trick b/c I still feel like I've been hit by a bus. I am glad y'all liked my sneak peek post - that's the only thing I've made in the past week or two - and I made a dozen of them! I have another project that is hopefully going to go live tonight (thank goodness it was made and I took pictures of it some time ago - otherwise I'd be stuck! I have NO energy right now...) - I'm just praying I can get it all typed up and whatnot in the next little bit! Gotta run (not literally) and keep and eye on the girls - Tim has to go back to work and get our landlord's phone # - apparently the furnace isn't working properly and it is FREEZING in here (I KNEW it wasn't just b/c me and the girls weren't feeling well!) - man I swear cosmic forces have REALLY been working against me this week! OK here's my sneak peek of some of Papertrey's soon-to-be-released stamps, ink and ribbon! As a lot of you know - I'm taking a gel nail course right now. 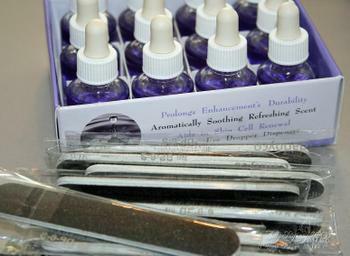 I bought a box of these small 1/4 oz bottles of nail oil and mini (3.5" long) nail files. My plan is to give the oil and files away to clients who refer new clients to me as I start this new business venture. Of course being a stamper these MUST be packaged up not only cute - but inexpensively. And I HAVE to make them myself!! 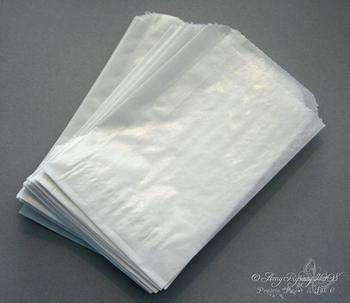 I started with a package of Papertrey's medium glassine bags - at $3 for a pack of 25 it's simple and affordable to keep several on hand. 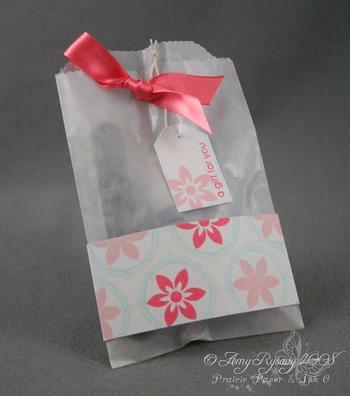 I took a sheet of Papertrey's Stamper's Select White card stock and stamped one of the images from the Boxes, Bags & Tags stamp set all over it using Aqua Mist ink. The stamp itself is perfectly designed to line up quickly and easily and with a gridline block it made it even faster to stamp the entire sheet. I used two of the flower stamps from the same set and stamped them using the NEW PT colors - Sweet Blush for the solid flower and Berry Sorbet for the detail flower. After I was finished stamping I cut the sheet into 1.5 x 7" strips and set them aside. I wanted to include a little tag with each bag - and one of the other new sets called It's a Celebration has this cute little tag image. I stamped the tag a dozen times onto a 1/2 sheet of Papertrey White CS with Aqua Mist ink. 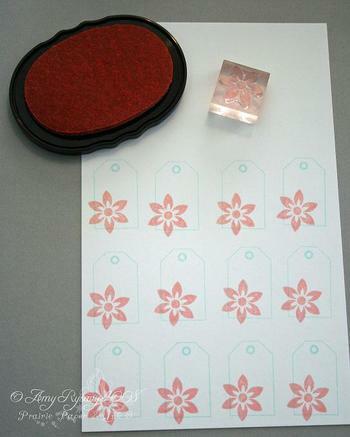 I then stamped the same detail flower used above onto the tags using Sweet Blush ink. I purposely stamped them a little off each tag as they don't have to fit perfectly. 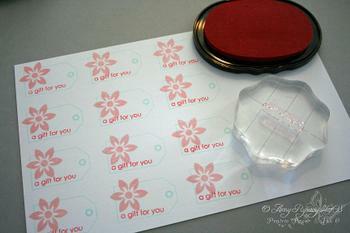 The "a gift for you" stamp is also from the It's a Celebration set - PERFECT for what I was making! I stamped it onto each tag using the Berry Sorbet Ink (and since the stamps are clear it was a snap to line them up perfectly each time). 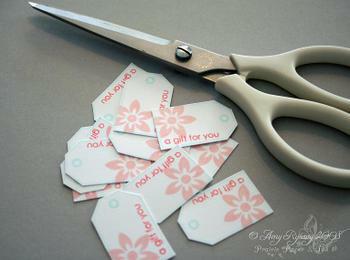 I cut out each tag with a pair of scissors - taking care to cut just a little outside the line of the tag. FYI the scissors are by Martha Stewart from Michaels. To dress up the bags I took the strips of card stock I stamped earlier and scored them with my Scor-pal. To find where I needed to score I just placed the strip of card stock on the scor-pal, then placed one of the glassine bags over it to see exactly where I needed to score (marked by the arrows). 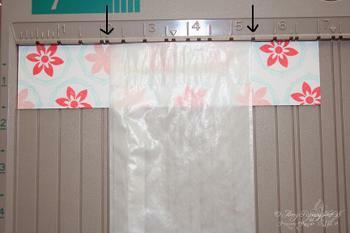 Once I knew the spots I quickly scored each piece then adhered them to the bags with double-sided tape. 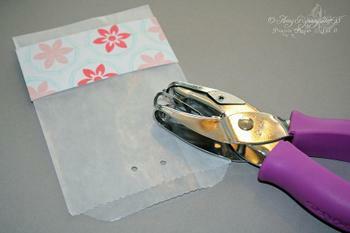 I used a 1/8" hole punch to punch 2 holes near the top of each bag, and a 1/16" hole punch to punch holes in each tag. I now have cute little custom packaging for these nail oil bottles and files - and the best part is is that I figured out the average cost of each bag when finished and they are about 33 cents each (that's the cost of the bags, 2 sheets of white card stock, about 3 yards of ribbon, and then I added a little extra for adhesive and the string I used for the tags). You could easily alter this idea to make bags for bridal or baby showers, birthday party favors, gifts for the students in your child's class etc etc etc and they would only cost about 33 cents each plus the cost of whatever you filled them with! Don't forget to check out the post below with the links to the other Design Team member's sneak peek posts and also check out Debbie's blog tomorrow to see what she reveals! And of course you all must remember to check out Papertrey's site on the 15th when the new stamp sets, ink, card stock, ribbon and patterned paper are revealed in full! Thank you everyone for the well-wishes - it really means a lot to me! Sadly we're all still sick here but I just CAN'T lay on the couch anymore - Tim had to go back to work, the girls are up and about even tho they're not feeling well, and as for me I just need to take it easy b/c when I overexert myself I start coughing and can't stop. Taylor made this pretty wedding gift bag using the new set by Alli Miles. And Lauren made this adorable birthday card and purse. 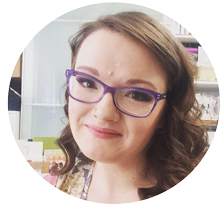 And of course don't forget to check out Nichole's blog - she's been posting all kinds of fabulous things using the soon-to-be-released sets, ribbon, inks and paper! OK that's it for now, I have to go rest for a bit and then I plan on getting some stamping done! Check back later K? ?